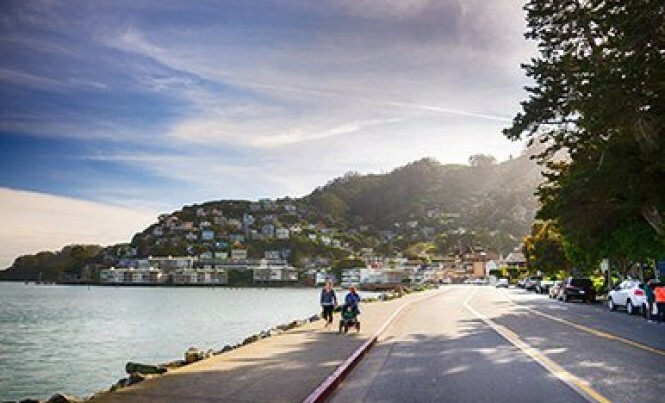 Just minutes across the Golden Gate Bridge from San Francisco, Sausalito is both a world-renowned tourist destination and an incredible place to call home. Once known for its bohemian community, many of whom lived in the houseboats that are still clustered along its waterfront, today Sausalito retains much of its old school charm. It also has a deserved reputation as an upscale, close-in alternative to the City, with an almost Mediterranean flair. Homes with million dollar views of the Bay, Angel Island, Belvedere Island, Alcatraz, and the San Francisco skyline dot the hillside above town creating a magical setting, but at times sunshine can be in short supply when the fog rolls in from the nearby ocean. Microclimates led to neighborhood nicknames like Hurricane Gulch and the very popular Banana Belt. Much of the downtown corridor along Bridgeway features businesses catering to the throngs of tourists that arrive by ferry from San Francisco, with a number of pricey waterfront restaurants boasting panoramic Bay views. While tourists flock to businesses along Bridgeway, locals head to pubs and restaurants along Caledonia Street, a.k.a. New Town. The Northwest end of town has a more low key, local feel, and is home to a number of condominium developments, many with Mount Tamalpais views. And of course there are the houseboats—some four hundred floating homes where you can find anything from a cozy little shack-for-one to a multi-level floating mansion with hot tub and helicopter landing pad. Like most of Marin, Sausalito offers breathtaking hiking and biking trails, and with the Bay being such a focal point, water sports are popular as well with many boaters and kayakers taking to the Bay on weekends.